I love this part. I love the challenge and the puzzle. What is the best way, the most efficient or, conversely, the route with the most important distractions, to help me arrive at my destination? On the afternoon of my first visit to the top of the Eiffel Tower the goal was efficiency, given the torrents of rain and the late afternoon start. “Oh, not to worry, you can visit La Tour now,” my ever-helpful hotel concierge, Michel, assured, when I decided to set out at about 4:30pm. “With this rain and at this hour, you should not have much of a wait.” Spurred on by this encouragement (in the past, I have resisted visiting the Eiffel Tower specifically because I did not want to spend a precious two hours waiting in the mile-long line), I skirted puddles and headed to the Metro. 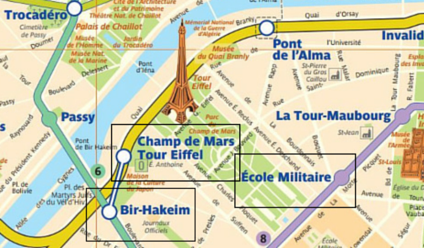 But, how to journey from the 11th arrondissement to the 7th, where La Tour lives? I suppose I could have asked Michel this question, too, but I wanted to figure it out on my own. Deciphering the Metro map can be so empowering! But finding the closest Metro station can be discombobulating when walking the unfamiliar streets. As I mentioned, the 11th arrondissement is a new area of Paris for me and I became expert at turning myself around and walking away from my appointed destinations. 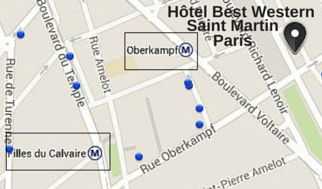 Which of these three stops are best accessible from my hotel? Oh, wow! After studying the metro map, I realized the best route was from Filles du Calvaire (very close to my hotel!) on line 8 (purple line) which leads directly to École Militaire stop! With no changes! It looked like I could relax for 11 full metro stops and make it all the way to my destination with just a short walk to La Tour! I sat and observed my fellow metro riders and wondered if Michel had been right about not having to wait in line at La Tour because of the hour and the rain. There was a short, wet walk from École Militaire and then a search for a lady’s room (not too far from La Tour – watch for the signs), and only a 15 minute wait at La Tour, and then I was on my way up to the top! Having seen those lines (queues) at the Eiffel Tower before, I was thrilled that my wait was almost nonexistent and I thanked the rainy and dimming skies for my good fortune! Sometimes rain can work in your favor! In fact, a good rule of thumb when visiting Paris, I have found, is do NOT let the rain stop you. Period. Oh! And, don’t let the Metro intimidate you, either. Even if you’re far away from where you want to be.